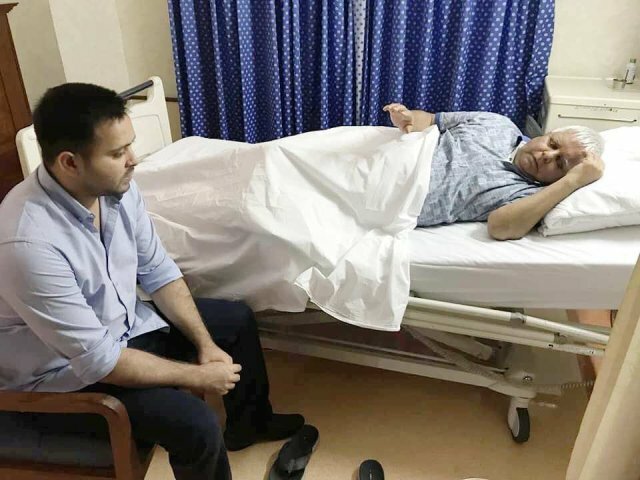 PATNA: A senior Bhartiya Janata Party (BJP) minister has urged his party government in Jharkhand to shift the critically-ill Lalu Prasad to a super-specialty hospital for better treatment. Prasad who heads the Rashtriya Janata Dal (RJD) is currently serving jail term. The request has come from none other than Saryu Rai who was one of the key whistle-blowers in the in multi-million fodder scam. Rai who is food and public distribution minister in the Jharkhand government has written a letter to the chief secretary, suggesting him to take necessary steps in accordance with the judicial and administrative process. “On November 18, I met Dr Umesh Prasad who is treating Laluji and he told me that Laluji’s health condition is critical. I feel he must be shifted to some super-specialty hospital for better treatment,” the minister told the media on Thursday. According to him, Prasad’s sugar and BP are uncontrolled and he requires better treatment. “I raised my voice against Laluji whenever he erred and also filed the first petition against him in 1995, seeking action in the fodder scam. But the fact remains that he is an old friend of mine and for this reason I went to meet him in the jail when he was convicted in fodder scam for the first time in 2013,” Rai told the Hindustan Times today. Media reports said the health condition of Prasad is deteriorating fast as he is unable to stand on his feet on his own. “His blood sugar level is increasing fast despite our best treatment. We found his blood sugar level under control but not stable despite administering insulin thrice a say. This is a matter of great worry for us,” Dr Umesh Prasad who is treating Prasad told the media on Thursday. The RJD chief currently admitted to the paying ward of the Rajendra Institute of Medical Sciences (RIMS), Ranchi, soon after his surrender before the Central Bureau of Investigation Court in August. Prasad is currently suffering from 14-15 types of ailments and one of the severest among them is that he is suffering from chronic kidney disease.